It probably started in Sept, 2008, when PHPCamp got 1200+ online registrations, and 700+ people actually turned up, making it the largest unconference in India. The following year, we organized an “Internship Mela” for students looking for internships amongst Pune’s startups, and we had to turn away 100s of students from the gates after we somehow managed to accommodate 800+. Over the years, this trend has continued. When DocType HTML5 came to Pune, the organizers had to shut down registrations after getting more than 600 registrations. When we organized PyCon Pune, the International Python Conference, we were expecting it to be much smaller than the first two PyCon’s that were held in Bangalore, since the Python community in Bangalore is much stronger. However, once again, we had to close registrations after the number of paid registrations hit 650, since the venue wouldn’t take any more. Raymond Hettinger tweeted that this was probably the biggest PyCon outside the US. Once is happenstance. Twice is co-incidence. More than that, and it needs to be given a name and a webpage of its own. Amit Kumar Singh called it “The Pune Effect” in a tweet in response to PyCon Pune becoming the biggest PyCon outside the US. So, this webpage is dedicated to the Pune Effect, and the amazing tech community in Pune. And it comes with a challenge. A challenge to all organizers of tech events in India – Why are you not in Pune? I’m looking at you, NASSCOM Product Conclave, and DrupalCamp, and Amazon AWSCamp. If you’re an organizing a tech event in India, remember that if you skip Pune, you are missing out on your largest event. And this is also a challenge to all the techies in Pune. We have to work to maintain this reputation. Follow the PuneTech Calendar where all the tech events happening in Pune are listed (you can subscribe to get all PuneTech events sent to you via email or via RSS), and the make it a point to attend. This will definitely help your career – you become more knowledgeable, and more importantly, you get to know lots of interesting and knowledgeable people. Not only should you attend tech events, but also drag some of your shy friends with you. The most active tech community in the country is right here in Pune. Are you a part of it? Earlier today, we published an article saying Pune’s Tech Industry to decline 40% by 2020, Negligible startup activity – Vivek Wadhwa. As many of you guessed (and, hilariously, some of you did not) this article was an April Fools day prank. An April Fool prank post is a tradition here at PuneTech. This year, Hetal Rach suggested the idea that a prank involving an article written by Vivek Wadhwa would be a good idea. Based on this, we made up the whole article, all the statistics and graphs, and all the expert comments too. I have no idea why my name is being used here and is linked to my website. I have performed no such research and don’t believe that the metrics used here are valid. We held the comment in moderation (so as not to give the joke away), and quickly contacted him over email to explain the situation. We are very thankful to Vivek for taking the whole thing with a sporting spirit. Pune may not be able to grow at its current rates, but I know of no reason why it should decline. To the contrary, it has built a stable of experienced engineers that are likely to want to start companies. They will boost entrepreneurship in the region. I’m sure entrepreneurship in Pune is flourishing and will scale newer heights. All of the “expert comments” in the “Reactions in Pune” section were made up by us. Arun Prabhudesai is indeed focusing on the education sector as part of My Open Campus, but has no intentions of introducing Java in primary education, and certainly does not want to upset the powerful Geography lobby. MrShri does want you to come to FourSquare Day Pune 2011 and find out for yourself. And I haven’t really checked, but I am certain that Rohan Dighe would heartily agree with his own advice that one should drink beer, write code, and let other people worry about the future. This time though, most people figured out that it was a prank, and hence there are very few real bakras in the comments section. However, many people who figured it out, used the comments section to unleash their creativity, so it is well worth a read. Also check out our April Fools Day pranks from previous years. Navin, there is no reason why Pune can’t become a center for entrepreneurship–build it’s own version of Silicon Valley. All of the ingredients are there. There is a highly skilled workforce, ambitious people who have experience and a desire to change the world, and relatively good infrastructure. What is needed is for experienced entrepreneurs to start mentoring the fledgling, and for the creation of networks where people congregate, exchange ideas, and help each other. This is how Silicon Valley works and how Indians have become so successful here. One out of seven tech startups in Silicon Valley have an India CEO or CTO–which is amazing considering that Indians constituted just 6% of the Valley’s working population in 2000. Pune can lead the nation in entrepreneurship and become a competitor to Silicon Valley itself if it does things right. This will take a decade or so to achieve, but is possible. You need to have the community get together and make this happen (note: I said community–not government). And yes, the world is such a small place because of the internet and social media tools like Twitter, that articles like this reach people like me. I saw the Tweets which mentioned my name and wondered why you were using this in vein. Much has been made of the rise of India as an IT powerhouse in the last 2 decades. The story has been nothing short of miraculous – with $76.1 billion in revenues, the IT software and services sector constitutes 6.4% of the GDP of India, and 26% of all Indian exports (up from just 1.2% and 4% respectively in 1998). Looking forward, the general consensus, especially of experts based in India, is that the next decade will continue to be one of high value-added growth. A popular opinion amongst industry watchers is that while the first decade of growth in Indian IT/ITES industry was fueled by IT/BPO outsourcing, and the second decade of growth was fueled by software product outsourcing, the next decade will see the rise of software products being built and marketed out of India. The thriving startup ecosystem in India (for example, national forums like Proto and Headstart, and the even more resurgent local forums like Pune Open Coffee Club) are seen as leading indicators of this change that is sweeping India. It has been clear to everybody concerned that this growth cannot really be driven by Bangalore, the poster city for the revolution. Bangalore and other tier 1 cities are already bursting at the seams as far as infrastructure is concerned, and there exists a massive problem of talent acquisition and retention. The general consensus was that the primary drivers of growth in the next 5 years would be tier 2 cities like Pune and Chennai, and tier 3 cities like Indore and Nashik would start contributing after 2015. Most of these predictions have been based on very superficial data, and in many cases, just on the gut feel of the experts. There hasn’t been an attempt at a systematic collection of data until now, and this report is based upon the findings of a first of its kind research project that we have conducted by going all the way down to tier 3 cities. Unfortunately for India, the results are not promising. The young and dynamic city of Pune, often referred to as the Oxford of the East, is an example of the second wave of growth of the Indian IT Industry. Although a historically very important city, since the merger of Mumbai into Maharashtra in 1960, Pune has had to live in the shadow cast by its big brother, and has often not gotten the recognition it deserved. However, with its large student population, much better quality of life than Mumbai, and the famous Puneri attitude, it was perfectly positioned to take advantage of the IT revolution, and had done so admirably. This chart shows how the competitiveness index of Pune is on a decline. A number above 1 predicts growth, while a number below 1 indicates that there will be a decline in exports within the next 3 years. This index is calculated based on the underlying trends that have also been plotted in this chart. Click on the image to see full-size chart. Starting from almost nothing in the ’90s, it managed to reach the $1 Billion mark in software exports in 2004, and now, at $8 B, it is widely believed to be on the verge of exploding. Unfortunately, though, all is not well. Just a half hour spent in the city (especially on a Thursday) will give an idea of the persistent problems that plague the city. Roads are a mess, and traffic is an increasing problem. The electricity board can barely keep the city on right now, and the problem is expected to get much worse in the next few years. A bigger problem is that the city’s famed educational institutions are turning out, to quote the colorful phrase of a frustrated city CEO, “half-illiterate idiots,” and finding talent is becoming more and more like looking for a needle in a haystack. 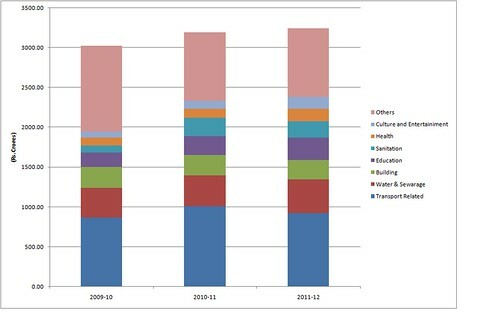 This chart shows the estimated software exports from Pune. The predicted declines is a direct consequence of the fall in Pune's competitiveness index. Click on the image to see full-size chart. As a consequence, Pune fares rather poorly on the Wadhwa competitiveness index, and based on that, the projected figures for Pune show that while it will see modest growth in the next two years, after that, there will actually start a period of decline for 7 years straight. See Figure 1 for more details. PuneTech caught up with some prominent personalities in the Pune tech community to gauge their reactions to this research. As expected, opinion is divided. Some have already seen the writing on the wall and started taking steps accordingly, while others simply see this as a challenge to try harder. As of last week, Santosh has quit Dubzer, and is joining Infosys as the head of their Software Language Services practice, where he will be responsible for translations of more than 20% of the world’s software products. In keeping with this feeling, Arun will now focus on educating our engineers. He is taking over as the HOD of the Computer Sciences and Android Studies Department at My Open Campus. “I don’t know what trends they’re seeing, but I think they’re completely wrong,” he opines. “It’s a joke to say that the tech industry in Pune will be just $5B by 2020. I expect just the Foursquare Based Services (FBS) industry in Pune to be $4.16B by that time, so the whole SoMe market will clearly be more than $5B. Come to Foursquare Day Pune 2011 and find out for yourself,” he challenges. Amen to that, we say! Update: As noted at the top, this article was an April Fools Day prank. To ensure that comments on this post did not give away the prank too early, some comments were held in moderation until the end of the day. All these comments have now been approved, but we have prefixed these comments with a [***]. Hence, when reading the comments below, please note that comments beginning with the [***] were not visible to anybody on 1st April.